Thank you for choosing SoftDetective! 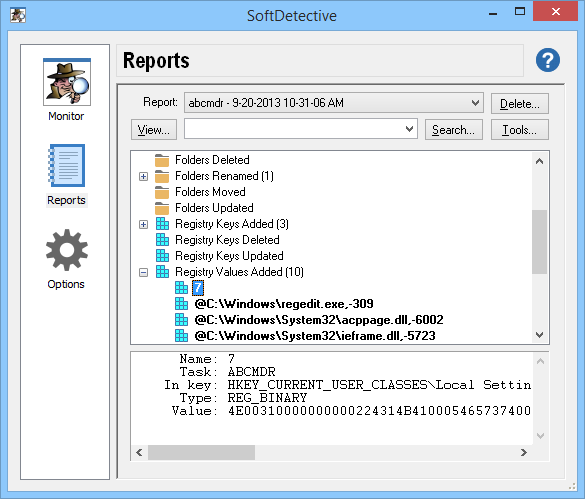 SoftDetective is a software utility that you can use to monitor activity of other programs and see which files were created or deleted, which registry entries were updated, and so on. Using SoftDetective, you can specify a program's file to launch (with optional command line parameters). SoftDetective will launch the program for you and keep an eye on the files and registry entries it creates, deletes, or modifies. When you tell SoftDetective to stop the monitoring, it generates a report about the activity it detected, that you can view directly in SoftDetective window. In addition to launching a program to monitor, you can also use SoftDetective to monitor the uninstall process or attach to the already running program. After a report has been generated by SoftDetective, you can see it in a tree-like structure that you can navigate to see the details of the events captured. When a program updates a file, SoftDetective displays the changes detected, such as the size of the file, the modification time, the version information, if applicable. For the text files, SoftDetective also reports the change made to the text. Similar information is also reported for the folders and registry keys and values. SoftDetective can also report which file and registry values where created, deleted, renamed, or moved. You can view the reports using SoftDetective, or export them as the text of HTML files, to view with a text processor or a web browser. Note: While SoftDetective can monitor the activity of the common programs, some situations can be tricky or impossible to monitor. See here for the troubleshooting tips.